Jadavpur Journal of Philosophy is a refereed, bi-issue journal, in English (No. 1) and Bengali (No. 2) published annually by the Department of Philosophy, Jadavpur University, Kolkata, India. 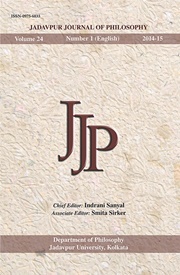 The journal volume in Bengali is titled Darsan Biksa. The journal is devoted to the publication of original scholarly papers in any branch of philosophy. Its objective is to encourage contributions from scholars, dealing with specific philosophical problems connected with their respective fields of specialization.